Brad Killam and his wife, artist-writer-educator-curator Michelle Grabner, transcribed the following conversation they had about Airport (2015), one of the terrific small-scale paintings that is included in Killam’s solo at Geary Contemporary. The exhibition, on view through March 17, includes both paintings and sculptures, each focused on the specific materiality of the chosen medium. The paintings revel in color, surface, and brushwork, while the tabletop sculptures, arrayed on a long platform in the center of the gallery, explore simplified form and purpose–as if they’re wood structures yanked from a construction site or perhaps someone’s basement workshop. The sculptures have an immediacy, as if they come together in an instant, but the paintings seem brooding, well worn, and harder earned. Michelle Grabner: I have the privilege of seeing you look deeply at your finished paintings. Sometimes I catch you staring at them for a very long time. I’m wondering what do you look for? Are you discovering something new? What do you see you when you are looking so intently? Brad Killam: I’m looking at whatever I did on the surface. How I laid paint down with one stroke or another. Whether a glaze was too thin or thick. Did I use too much linseed oil? Whatever the case may be, I’m looking for technical processes that did or didn’t work out. I might try some aspect again in a different way. MG: This painting has been hanging in our house for several years. Look at it on a daily basis and it is still one of my favorite paintings. I think of Whistler every time I glance at this painting, specifically his Peacock Room because it features a similar, dazzling blue and green palette. I enjoy the light absorbing surface of the irregular blue geometries that float over the surface of the more reflective green space that suggests dense foliage. 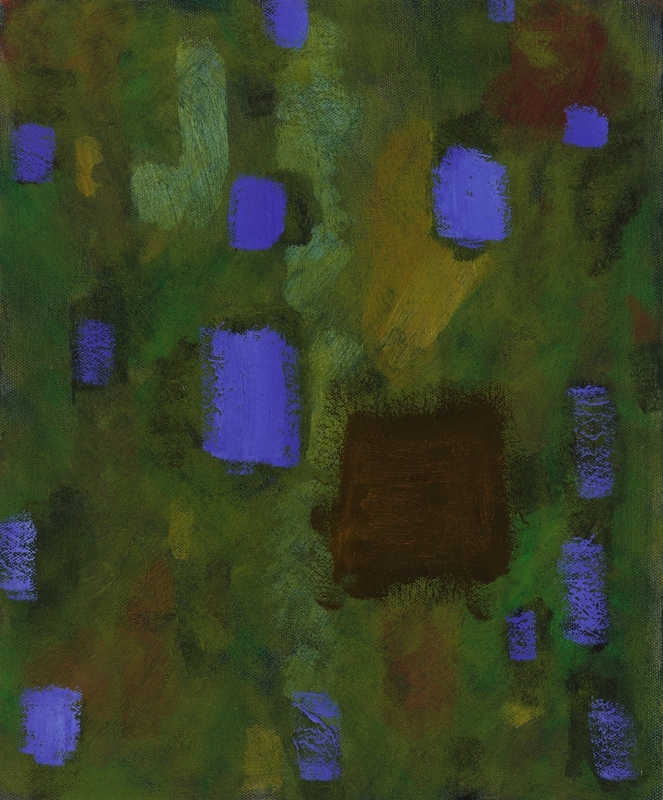 The potential anomaly in the painting is a singular dark brown form, which also floats over the glazed emerald green ground, but in a different spatial register than that of the blue forms. I never stop appreciating how spatially dynamic and seductively saturated this little painting is. Yet it is not cloying and still tough, which I think comes from the brush marks and the surface structure. What do you see when you look at this painting? Did it start out as an abstraction? BK: I started that painting at the Iola Airport in Central Wisconsin. It was originally in a landscape orientation, now it’s a portrait orientation. It was painted on location and some of the shapes were suggestions of little airport hangars. The Iola airport is a grass-field airport, so there is small-scale architecture laid out in green field. I don’t think the painting was gren in the beginning, back in whatever year that was when I started it: probably a range of primary colors as a first layer. At some point I was very dissatisfied and I shelved for quite a long time. When I returned to it, I decided the appropriate thing to do would be to lay down and overall green-yellow glaze. I consciously decided at some point that it’s no longer going to be representational, or even an impression of fields and small buildings. Rather, it would just simply become a painting about pattern and color, mark and surface. The blue is kind of a King’s blue with a wee bit of violet in it and some of the marks are pretty heavy or dense impasto surfaces, while some of them are nearly transparent like dry brush. The intent was to move that blue around the composition in various places to activate the overall composition. I was pleased with the choice of blue and that brown-green-umber you mention: that singular square like shape. It’s a spot glaze laid over previously unsuccessful marks. I didn’t like the color that was there so I changed it to this brown in the foreground surface. MG: For me there are always two approaches that I take when analyzing your paintings. The first is to attempt to translate the thinking that takes you from an in situ condition—and an engagement with representation—to abstraction. What leads you away from the depiction of a literal space to a painting that examines and celebrates orm, pattern, color, and composition? How did you get from the deep spatial perspectives of an airport landing strip to the flat distribution of blue marks that imply an all-over field, which extends beyond the painting’s edge? Was there failure in representation that led you to pivot to abstraction and beauty? But then I also have to evaluate what is given and evaluate the distribution and intensity of the painting’s formal and material elements: to examine the hierarchies at play between color and shape, edge, and field, flatness and pictorial space, absorption and refraction. For example, I trust that the blue rectilinear shapes populate well beyond the field of the painting’s support and thus I also understand that the singular brown geometric shape is repeated in a pattern elsewhere as well. I just can’t see it. And there is the stippled weave of the canvas that punctuates some areas with homogeneous surface texture and then, in other areas, it gives way to impasto brush strokes. But if I had to prioritize, I would say that this painting is about intensity and dispersion of jewel-like colors that refuse the predictability of decoration. And, of course, this always leads me to history, from early twentieth-century American abstraction to British painters such as Howard Hodgkin and John Hoyland.